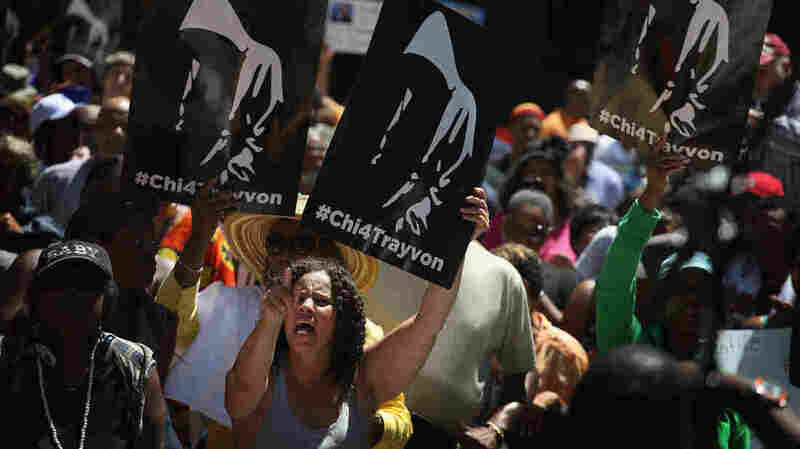 'Justice For Trayvon' Rallies Held In Numerous Cities : The Two-Way The Rev. Al Sharpton's National Action Network says it's organized rallies in 100 cities across the country to press for civil rights charges against George Zimmerman. 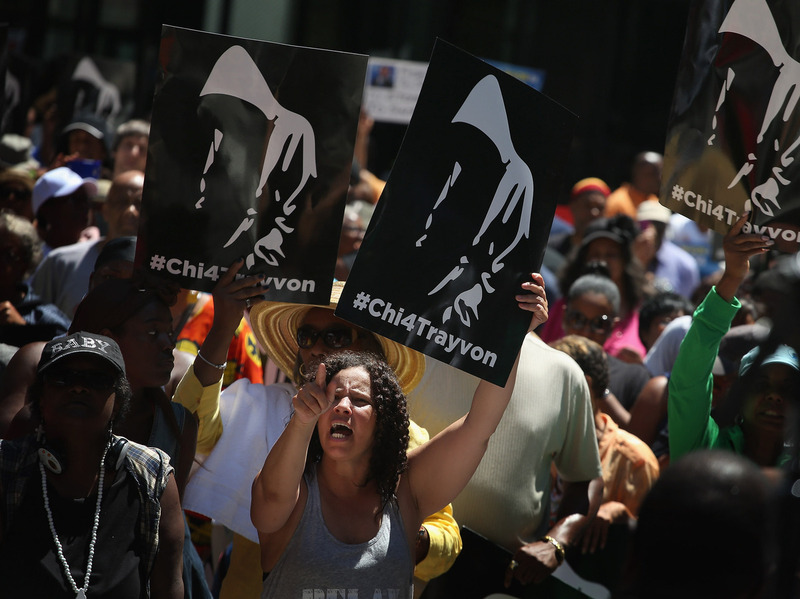 Demonstrators attend a "Justice For Trayvon" rally in Chicago on Saturday. 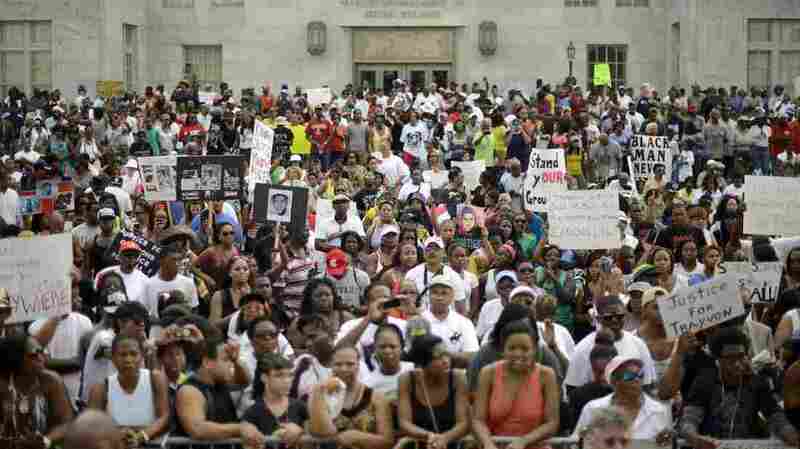 Hundreds of people across the country attended "Justice For Trayvon" rallies calling for civil rights charges against George Zimmerman in the wake of his acquittal a week ago in the fatal shooting of black teen Trayvon Martin. The Rev. Al Sharpton's National Action Network organized the events following last Saturday's verdict in Sanford, Fla., in which six jurors accepted Zimmerman's claim of self-defense during a scuffle with Martin in February 2012. 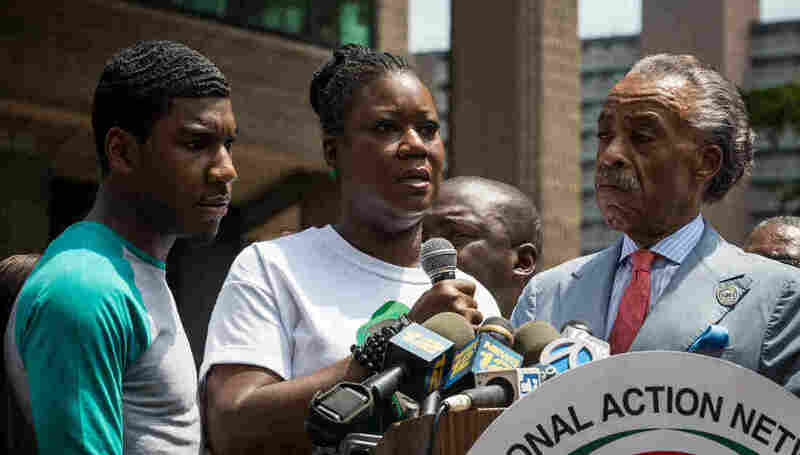 Trayvon Martin's mother, Sybrina Fulton, attended the event in New York, where Sharpton called on those gathered to create a new, peaceful movement for change, reports NPR's Dan Bobkoff. "Not only do I vow to you to do what i can for Trayvon Martin, I promise you I will work hard for your children too because it's important," Fulton told the crowd. Sharpton said he wants to fight Florida's "stand your ground" laws and for the Department of Justice to pursue civil rights charges against Zimmerman. Meanwhile, Trayvon's father, Tracy Martin, spoke at similar rally in Miami. "I'd like the world to know that Trayvon was my son. He was a loved child. He did nothing wrong and we're not going to let them persecute him he way that they have," Martin said. The vigils follow remarks by President Obama on Friday in which he acknowledged that "Trayvon Martin could have been me, 35 years ago." The president went on to say that African-Americans aren't naive, that they understand that young black men are disproportionately represented in the criminal justice system both as suspects and victims. But, he added, that's no reason a 17-year-old like Martin should be treated differently than anyone else. "Folks understand the challenges that exist for African-American boys," the president said. "But they get frustrated, I think, if they feel there's no context for it. And that context is being denied." Organizers said gatherings would also take place in Los Angeles, Des Moines, Iowa, and Little Rock, Ark. A crowd gathers for a rally in protest of the not-guilty verdict for George Zimmerman in Atlanta on Saturday.